The Russkaya Psovaya Borzaya has been an integral part of the national culture and Russian history for 9 centuries. The French Chronicle of the XIth century shows that three Borzois accompanied the daughter of the Grand Duke of Kiev, Anna Iaroslavna when she arrived in France to become the wife of Henri I. Among the owners and breeders there were many famous people including Tsars and poets : Ivan the Terrible, Peter the Great, Nicolas II, Pushkin, Turgenev. The creation of the famous kennel Pershinskaya Okhota by the illustrious breeders the Grand Duke Nicolai Nicolaevitch and Dimitri Valtsev had great importance. 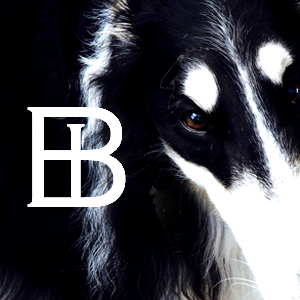 From the end of the XIXth century, the Borzoi is seen in the biggest breeding kennels of Europe and America. Viewed from above as well as from the side - lean, long, narrow, aristocratic. Seen in profile, the lines of the skull and muzzle form a long, slightly convex line, the line of the sagittal crest being straight or slightly oblique towards the well marked occipital protuberance. The head is so elegant and lean that the principal veins show through the skin. Narrow; seen from above : elongated into an oval shape; seen in profile, almost flat. Large, mobile, considerably prominent in relation to the lower jaw. Long, filled out in all its length, slightly arched near the nose. Fine, clean, well fitting. The eye-rims, the lips and the nose are black whatever the colour of the coat. Strong underjaw. Teeth white, strong; scissor bite or pincer bite. Large, very slightly prominent, expressive, dark hazel or dark brown, almond-shaped, but not slit-eyed, set obliquely. Small, thin, mobile, set on above the eye level and backwards, pointing almost towards the nape of the neck when not alert. The tips of the ears are situated near each other or directed downwards along the neck and close to it. When the dog is alert, the ears are carried higher and on the sides or forward; sometimes one or both ears are erect like horse ears. Broad, muscled, elastic, forming with the loin and croup a curve which is more pronounced in the males. The highest point of this curve is situated ahead of the middle of the loin or in the region of the 1st or 2nd lumbar vertebra. Long, prominent, muscled, moderately broad. Long, broad, slightly sloping. The width of the croup measured between the two hip bones (iliac crests) must not be less than 8 cm. Of oval cross-section, not narrow, yet not wider than the croup, deep, well developed in length, spacious, reaching down almost to elbow level. The region of the shoulder blades being flatter, the chest gets gradually wider towards the false ribs, which are short; seen in profile, it forms a change in slope. The ribs are long, slightly prominent. The forechest is slightly prominent in relation to the scapular-humeral articulation. Shoulder blades are long and oblique. Moderately oblique; its length is barely superior to the length of the shoulder blade. Angle of the scapular-humeral articulation well pronounced. In parallel planes to the median plane of the body. Clean, long, of oval cross-section; seen from the front, narrow, seen in profile, broad. Slightly oblique in relation to the ground. Seen from behind : straight, parallel, set slightly wider than the forequarters. When the dog is standing naturallly, the vertical line dropping from the ischiatic tuberosity (point of buttocks) must pass in front of the centre of the hock joint and of the metatarsals. Well muscled, long, placed obliquely. Long, muscled, placed obliquely. The femoro-tibial and the tibio-tarsal articulations well developed, broad, clean; the angles must be well marked. Not long, placed almost vertically. Flecks of the same shade as the ground colour. Of round cross-section. Any deviation of the forearm. Colour : Flecks on the body of another shade than the ground colour.